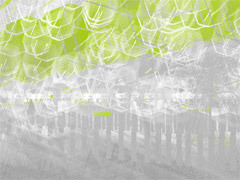 this year johannes and one of my students are exhibiting at siggraph. johannes presents our software instantreality and demos at khronos group’s booth. 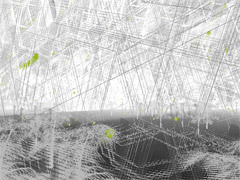 marion won the space time competition and shows her work “ce.real” she did in my course “experimental interfaces” last semester. a 8bit style world works as real time information graphic. 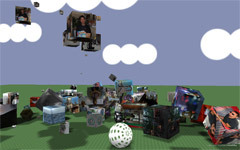 just posted flickr images mapped on boxes are falling from the sky on a dump of images in real time. the world features realistic realtime shadows and physics. 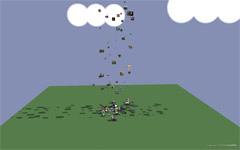 thus a huge chaos is produced by the falling boxes. 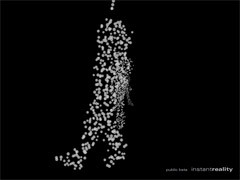 a katamari damacy like ball with physical forces rolls through the dump in order to increase chaos and to give an impression about the game capabilities of the concept. Sorting the dumps by tags and time will come soon. 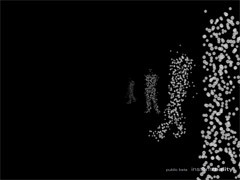 the installation converts silhuettes of persons into physical bubble particles swimming to the surface. 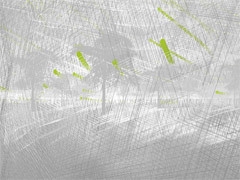 a minimalistic scene of trees and ascending elements in white fog rendered on a colorkeepbackground. 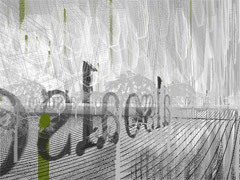 the silent scene becomes positive chaos and renders incredible unforeseen images.